John O’Groats may be best known for its jaw-dropping location at the top of mainland Britain, but that’s not the only reason you should visit! Located in a dramatic coastal location, it’s the perfect spot to base yourself as you discover natural wonders, incredible attractions and exhilarating activities in the north of Scotland. So why not have a few days, or even a week, in John O’Groats? Here are seven great ideas for things to see and do on a memorable trip in the North Highlands! This coastal part of Scotland isn’t short of stunning walks. You can explore the challenging cliffs around Dunnet Head, which is the mostly northerly point of mainland Britain, or venture to St John’s Point where you’ll come across natural harbours and enjoy great views of the Pentland Firth. If you only do one walk, then pick the path from John O’Groats to Duncansby Head where you’ll see two incredible sea stacks. Open from mid May until the end of September, The Castle of Mey is one of Caithness’s most treasured gems and has interesting royal connections. It was bought and lovingly restored by the late Queen Mother in the 1950s and it became one of her favourite places. The castle’s interior is full of special personal touches and stories, whilst the grounds consist of acres of beautiful gardens, perfect for exploring. Do you like your castles dramatic, mysterious and, er, roofless!? Then you need to visit Castle Sinclair Girnigoe. This clifftop ruin is steeped in a turbulent history that includes disputed claims of ownership and seizure by Cromwellian forces in the late 1600s.Located not far from Wick, it’s set amongst some stunning coastal scenery and you can often see seals bobbing in the waters below, so don’t forget the camera! Should you fancy getting acquainted with whisky, Scotland’s national drink, a visit to Pulteney Distillery in Wick is a must. Take a tour to see behind the scenes at this historic distillery and discover the time honoured process that goes into crafting Old Pulteney single malt whiskies, known as the ‘Maritime Malt’. The experience is finished with a whisky tasting – see if you can detect distinctive sea salt and brine on your palate! From May to September, take the John O’Groats ferry to Orkney and see many of the islands’ highlights. The crossing over the Pentland Firth takes only 40 minutes before you embark on the maxi day tour, taking in the archaeological sites of Skara Brae, the Ring of Brodgar, the Stones of Stenness and the Churchill Barriers, as well as the charming towns of Stromness and Kirkwall. For history fans, it’s an unmissable trip! Did you know John O’Groats lies on an epic 500 mile driving route through the North Highlands? Adored by drivers, bikers and cyclists alike, the North Coast 500 is now world famous for its remote, rugged landscapes. Whilst you might not want to take in the whole route, you could plan a day following the section east of John O’Groats, stopping at secluded bays and sandy beaches for picnics and walks, soaking up the scenery as you go. It’s not surprising that the best chances of seeing Northern Lights are in the north – it’s in the name, after all! 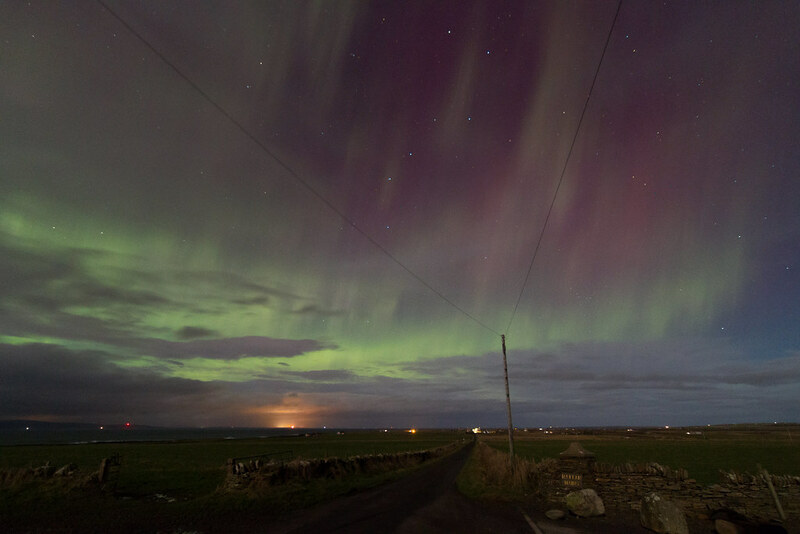 Even when there are low geomagnetic readings, this spectacle can often be seen from Caithness, dancing in clear skies over Orkney. The Aurora Borealis is a natural phenomenon so when it comes to witnessing them, it’s a case of being in the right place at the right time. Sign up to Aurora Alerts to get notifications of when there is geomagnetic activity. And once you’ve done all that, you’ll find there are wildlife boat trips, historical fishing ports and ancient chambered cairns and brochs to be experienced too. And, of course, miles and miles of awe-inspiring coastline! Find accommodation in the area or discover more about the North Highlands.